Trent Siggard got a Squirt, and he showed me some skateboarding videos he shot. I originally designed the Squirt to be a small Hero carrier, and used ducts to increase thrust. I wasn’t thinking at all about prop guards, but it turned out the ducts’ safety factor was just as important as their added thrust. Trent’s footage was a good demonstration of just that: the feeling of security lets you fly closer to subjects with confidence and get cool new angles. The problem with this extreme proximity is that it makes framing more difficult. It’s pretty easy to frame a subject at ten feet, but when you get within 2-3 feet it gets exponentially more difficult to center your subject. Not only that, maybe you want to shoot someone from the ankles, but with massive uptilt to include his whole body. Trent and I agreed that a servo actuated camera would be a nice addition. He started listing things he’d like to put on his Squirt: front/back cheaterkwad cams, servos, maybe even twin GoPros. I cringed at the thought of putting more weight on a Squirt, but Trent’s requests got me thinking. What if we thought of this platform as a ‘safe’ quad instead of a ‘small’ quad? What about a bigger Squirt that’s just as safe, but with the capacity to lift whatever you want to throw on it? Thanks to experiments by Zoe Stumbaugh and Clint Hild, I know the Dualist can lift obscene amounts of weight on 5 or 6s. What if we took that 4” power train and trimmed the props a bit? I arrived at 85mm props because a pair of ducts will just fit on a 200x200mm bed. All that was left was to design around that spec and build it up, and see how well it would fly. 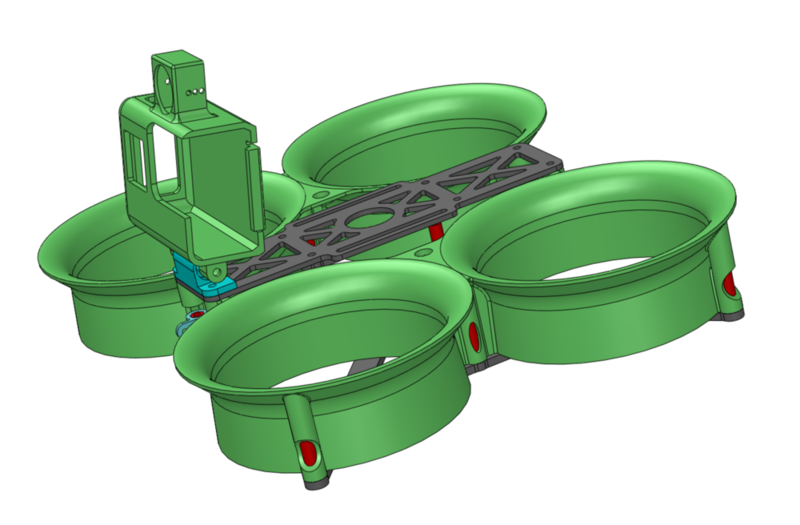 One of the key features of Squirt V2 was a shortened main body, because centralizing mass improved flight characteristics. However, if you’re going to put a camera on a servo, you’re going to have to move it forward to get unobstructed video at all angles. So I’m hoping the greater thrust of 22xx motors will produce the authority to make this thing fly well despite its de-centralized mass. I kept the standoff spacing the same as the Squirt so they could share cam mounts and accessories. Finally, I put SMA mounts on the ducts so you can put fpv cams front and back. Next I adapted Ichabod Jr’s Hero mount to be servo actuated. There’s a few ways you can configure this. You could put your fpv cam on top and frame the shot as you fly. That’s how Gab flies his Ichy. Or, you could put another fpv cam on it and feed that video to a camera operator. The whole point of this thing is to be adaptable and modular. The blue piece takes 10mm bearings. A 5mm od standoff slips through the whole thing. Then I bought some 9g servos and designed a mount around it, integrated with the bearing holder. I thought it’d be cute to use a Tiny Whoop sized cam/vtx on the Hero, so I drew up a mount for a Crazepony aio and a battery slot, then integrated a servo horn with the battery slot. Time to build. I went with Brotherhobby 2206 2600kv’s, Lumenier Lux F7, Hobbywing 45a 4in1, 2 Runcam Micro Eagles, and a Rush fpv vtx (‘cause it’s stackable). On top of that there’s a Crossfire Nano for flight, and a Frsky X4r from the parts bin for the servo. All in all, a crazy nice spec for a slow flyer. So. Much. Stuff. Note the X4r up front for the servo. Using a servo plug so the top plate can disconnect and separate for repairs. I’m not the best builder, so I was pretty shocked that I wired this thing up correctly on the first try. It was definitely one of my more challenging builds. It hovered at about 40% with a big ol’ 1300 5s. I took a short lap around the apartment that night – I never thought I’d ever fpv maiden a 5s rig in my apartment! Still messing with print settings. Note the one glossy duct and one fugly duct. Using up old spools of filament so the proto is extra colorful. Robert McIntosh had sent me a free copy of ReelSteady ages ago, but I never got it up and running. ReelSteady works with an older version of Adobe Premiere, but I use my wife’s Adobe account and was scared to mess with it too much. Besides, I’m a frame maker, not a video content creator, so I never felt the urge to fully learn ReelSteady. Then Hypersmooth came along, and that made me EVEN lazier. Then, Robert sent a key to a beta update of RS. I wasn’t too excited at first because I’m so hopeless with Premiere, but then Randy Slavin told me that this update was a standalone app instead of a plug-in for Premiere, so I downloaded and …WOW. This was easier, faster, better, amazinger, just everything you could hope for, something even a video editing idiot like myself could embrace. The video above was flown on a Hero6 and run through ReelSteady (RS works better with the 6). That first test was flown with the servo fixed, so it was a fairly normal flight. I’m using a 9g servo here, and I think the Hero is a bit heavy for it, so it’s super jittery. I thought the footage would be awful but just had to give it a try outside with dual operators. I called up Randy and we did a quick test the next day. Here’s what the setup looked like. A 1s battery slots in behind the Hero. I tried some Gemfan 5552’s (for science), and they rise up out of the sweet spot of the ducts. It’s not ideal but she still flies fine. Here’s what the raw footage looked like. Amazing, right? I ran it through RS again, with smoothness dialed up and horizon locked. It’s a virtual gimbal! And here’s the 6 with ReelSteady, on cheater mode. So both work! RS has the advantage because you can dial in your level of smoothness, as well as lock the horizon. But it’s good to know you can throw a 7 on there and get good footage right out of the camera. I’m still going to try some better metal gear servos, but it’s good to know the little crappy ones can do the job. Here’s another clip with the horizon locked. As an fpv’er rather than a dji’er, I’m philosophically opposed to horizon lock. But I gotta say this level slaloming looks kinda good. As for the quad itself, I flew it on 5 and 6s, and it flew great. I wasn’t trying anything crazy but it behaved totally predictably and handled the spread out weight just fine with no yaw twitches. I also killed the 1s battery ‘cause that’s one more battery than I’m used to having to unplug. Meanwhile metal gear servos came in, and the best thing? It’s the same exact size! No redesigning! It’s way smoother, not gimbal-smooth but at least jitter free. Gab burned out a servo on his Ichy Jr., but we were unsure whether it was from stress or a landing in snow. This mount is more taxing than Ichy’s mount, since the pivot point is farther from the camera’s CG. I updated the servo housing with a couple ‘springs’ to take some of the load off the servo. See those holes for the pushrod? They’re made with a hot wire since they’re a bit too small to resolve with printing. Those two tabs don’t contact the camera when it’s upright, so they don’t add any drag to the pivot motion. Once the camera tilts more and gets ‘heavy’, the springs make contact and support its weight.